EuropeShire is an independent school camp project. During one week your group of students will be able to improve their English while meeting with other youngsters from Europe. The project is didactic and fun. It is a mix between conversation workshops led by English native speakers on various topics, sports activities, games or even arts & crafts. Participants will have the opportunity to interact in English during their entire stay. They will be sharing their rooms with different nationalities which will encourage them to open up and bond. It has been proven that learning a language is faster when put into context. At EuropeShire your students will learn by practicing. They will be put at the center of their learning. The project is tailored so that your students will have many opportunities to speak English with other students during their stay with us! This school camp is available for students from the age of 14 to 17 years old who have reached at least an A2 level according to the European Common Language Framework. We will do our best to match the same age group together, although this depends on the week you will register for. We accept groups of any size as long as students from bigger groups understand that the objective of the project is to mix and communicate with others! 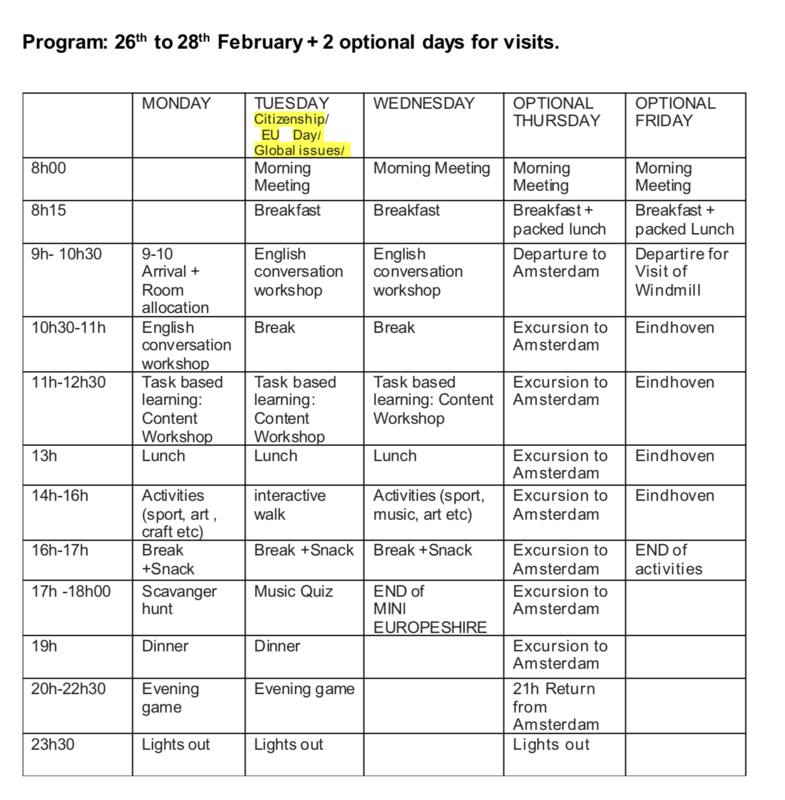 EuropeShire will take place in a youth hostel in The Netherlands. Harba Lorifa hostel is situated in the countryside just outside the city of Eindhoven about 2h away from Amsterdam. or in BuitenJan hostel which is 10km from Eindhoven as well in the countryside. EuropeShire runs from Sunday afternoon to Friday afternoon. MACRO EuropeShire for students between 18 and 25 years old. EuropeShire school camp project aims at improving language skills as well as communication, problem-solving and critical thinking ones. Our main goal is to create an environment where students cross language barriers. As a teacher you probably know how important it is to use English outside of the classroom. For all these reasons we have tailored a program that encompasses conversation workshops, content workshops, sport activities and many others. During the English activities in the morning, your students will be mixed with other students from different countries in groups of 10. In the afternoons students are free to join any activity however, it is important to keep a fair mix of “same school” students in each activity in order to increase the opportunity of speaking English. Each week there will be native speakers (staff) who will lead most activities. Teachers will also be leading some activities as it important for the students to see that their teachers are taking part in the project with them. When the teachers are breaking boundaries they set the tone for the students and encourage them to do the same. participants are required to contribute financially to the the camp. Europeshire is a private project not connected nor funded by any European program. The project was launched by a high school teacher. Previously involved in many exchange programs such as Comenius, Erasmus, English Exchange in England, private school exchange and many other sporadic projects one came to realized that all these programs were missing the “human” EXCHANGE factor. Often during those programs students were busy assisting passively to some lessons or sightseeing. Frustrated by the lack of EXCHANGE among students as well as by the little improvement of the target language it was time to set up a DIFFERENT project. EuropeShire appeared as evidence. The project will host students from different horizons whom will have to communicate in the target language at all time. Teens talking to teens. 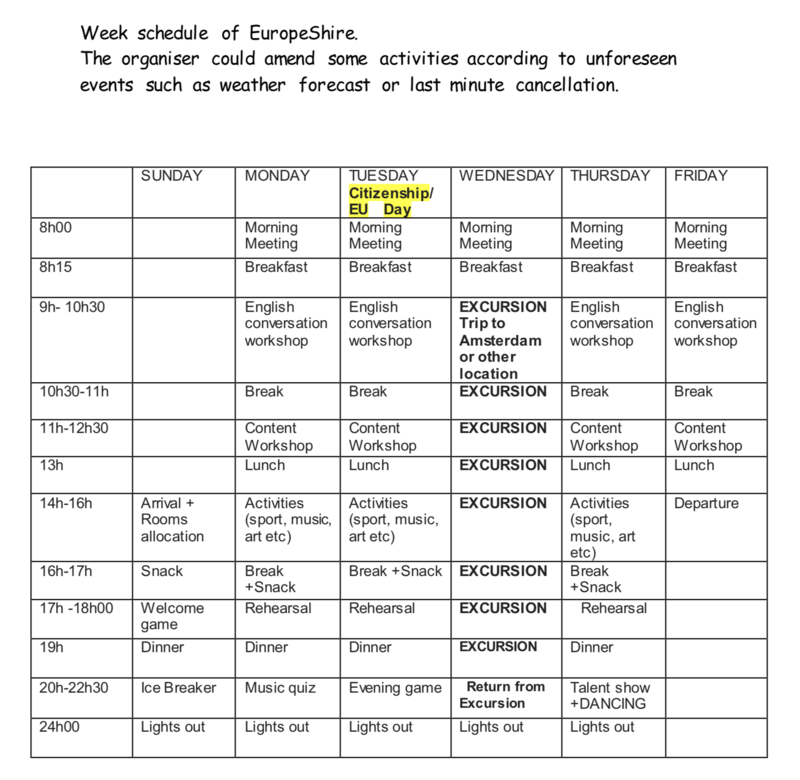 EuropeShire was thought by teachers tired of working overtime preparing exchange programs under a strict school frame, rules and regulations. This is a project where teachers only need to register their students and the rest is taken care of. Reducing the bureaucracy of European projects and putting the students back at the center of these ventures. As a dynamic teacher you probably know how exhausting it is to deal with your international partners, heads of schools, European bodies, students, parents etc. Not mentioning thinking of activities and booking visits. In the background of EuropeShire, there are teachers whose objective is to inspire students and to give them a real opportunity to connect with their peers in real life. No computers to hide behind, it is about time our youth learn how to communicate better and in English! Feel free to contact us! We'll answer as soon as possible.